First of all, we find it important to thank everyone who visited our stand at Eurotier for the interest shown. First and most important, thanks to all our familiar dealers and customers. Besides that we are very glad and excited about the interest of all people that were not yet familiar with the innovative power of VTL. As you might have seen, VTL has shown a few innovative and competitive products. Competitive in terms of prices in the international field, but even more important competitive in terms of quality. Below a short overview, in the specific topics you can also find the links to the corresponding page on our website. In case you have additional questions, or if you are interested in a customer-specific supplement or offer? Please contact us so we can help you with the most optimal solution of our VTL products for you. We are looking forward to get in contact again! 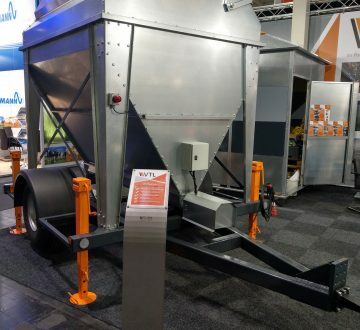 The VTL mobile storage unit is most suitable for transporting relatively small quantities of feed on own land or transport at difficult locations such as in meadows. The VTL mobile storage unit has a capacity of 5 m3 and has a lid that can be opened over the entire length. Coupling to the feeding system can be carried out within 1 minute by the quick couplings and plug connections. In addition, the mobile storage unit can be equipped with a 380/400 V drive or hydraulic motor. Also a 220 V engine is of course one of the options. 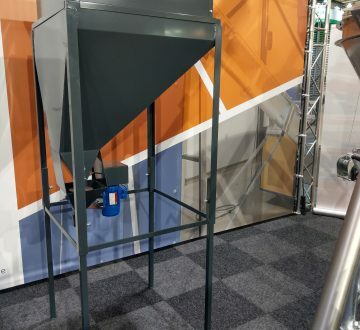 Thanks to the smart application of a sensor, the dosing from the VTL mobile silo works fully automatically after it is connected to your feeding system. Of course, the VTL mobile storage unit can also be implemented as a filling silo for existing storage units. For each customer an inventory is made of which drive and dosing speed best suits the situation. Of course all VTL standard products from the large diversity. You are therefore always certain of the best solution for your situation. The VTL Cone Mixer is one of the most robust mixers for mixing various components into a homogeneous (feed) mixture. The Mixer has a screw that "lifts" the components that have to be mixed. By forcing the auger through the mixer at the same time, a well-mixed composition is created quickly. The VTL Cone Mixer is available with a capacity of 1000 - 5000 liters and is often used in pig farms, poultry farms and cattle farms. A welded and smoothly-finished variant is also available for industrial applications. For the dosing from he mixer to e.g. a transport system can be chosen from various diameters pipe connections and outlets. You can also choose for a short dosing screw as an input for the following (feeding) system. 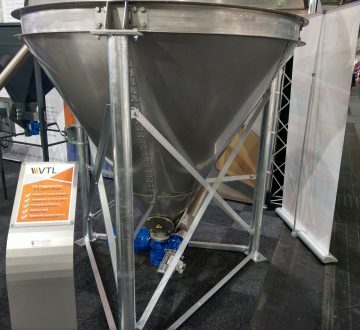 The VTL cone mixer can be equipped with a very stable 3-legged chassis, ideal for placing the unit on load cells. 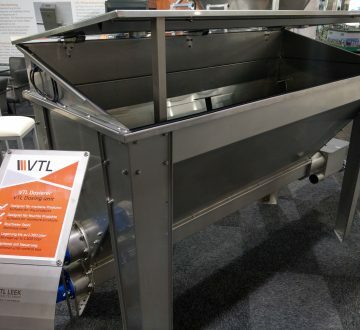 The VTL cone mixer can also be completed with a weighing set and display. Due to the way VTL designs its own products, the cone mixer is delivered in such a way that it is immediately ready for operation. A lid with hand winch is available for outdoor seating. Even here an electrical operation is also one of the options. VTL has been supplying storage units, mixers, augers and dosing units for more than 50 years. When these have to be placed outdoors, a polyester cabin has mostly been used to protect installations for influences as rain and wind. Nowadays, our customers increasingly choose for a VTL metal cabin that can be supplied on a pallet and built up on site. The smart design ensures that transport costs can be kept to a minimum. 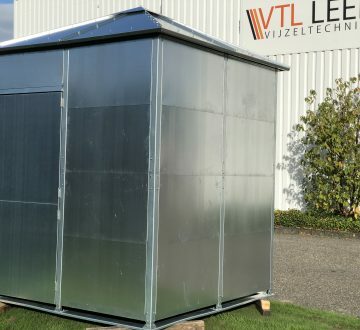 The VTL cabin is standardly supplied in a galvanized steel version. On request, the cabin can be coated in any color. Powder coating is then done by means of coating the galvanized side sheets of the cabin. The frame can also be supplied in any color. The advantage of the VTL metal cabin is also the ease with which options such as a (metal) shelf or hanging eyes can be placed. Something that certainly benefits the work in the cabin! The dosing unit of VTL can be used for many different materials. Materials often dosed with the VTL dosing unit are moist products such as CCM or silage maize, but also several minerals, calcium and lime. The unit is completely made of stainless steel and has a storage capacity of 1000 liters as standard. The ingenious system inside the dosing unit prevents bridging. Optionally, items such as a winch post for opening the lid (optionally electrically operated) or weighing cells can be offered. By using a standard set of weighing cells it is possible to see the contents of the unit at any time. Of course it is also possible to link a weighing signal to your own (feed) computer. VTL also offers a wide variety of dosing systems for dosing various materials from the dosing unit. For example, it is possible to purchase a fully automated system for the dosing of silage maize at many different locations in your house. For lime dosing, VTL now has the necessary experience with dosing quicklime in manure silos. Of course there are several other products that are suitable for dosing from the dosing unit of VTL. VTL also supplies a smaller dosator for dosing minerals and other powdery materials. The unit is built up of mostly stainless steel components with a steel screw, which is of course also available in a stainless steel variant. The VTL mineral dosator (VTL MIDOS) is often used for dosing minerals in mixers (for example a VTL Cone Mixer). For the most difficult materials, it is possible to equip the MIDOS with an extra wheel for loosening the material to be dosed. Of course, it is also possible to supply the VTL MIDOS as a complete set on load cells for accurate weighing of the contents of the doser. In addition, it's possible to equip the dosing motor with a frequency regulator so the yield of the dosing can be adjusted accurately. The VTL gritdosator is used for many years and in a lot of countries around the world for dosing small granular products. 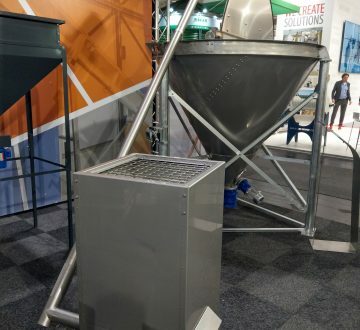 The most frequently used application is the dosing of grit in a feed weigher or the direct dosing of grit/limestone on a feed auger. The VTL gritdosator is often placed directly above a feeding auger and thereby switched on as soon as the feed auger is actuated. Due to the simplicity of the concept, the VTL gritdosator is very easy to integrate into existing (feeding) systems. So with a relatively small investment the quality of egg shells in a breeder house can be improved substantially. Due to the various possibilities for the use of the VTL gritdosator, the VTL gritdoser allows for a very fine adjustment of the dosage. The VTL gritdosator can be supplied with adjustable legs fort the best positioning of the unit near any feeding system. In addition, the VTL gritdosator is available with a frame for hanging on a wall. Ofcourse, it is supplied with a complete manual.